TalentKeepers executives Craig Taylor and Christopher Mulligan show how to inspire people to commit to their employer, their role and their leader. (Winter Park, FL) — March 11, 2017 — A new book, written by TalentKeepers executives and co-authors Craig Taylor and Christopher Mulligan, will show business and HR leaders how to get more employees engaged, raise performance and improve retention. This Talent Keepers book is available on Amazon and Barnes & Noble. 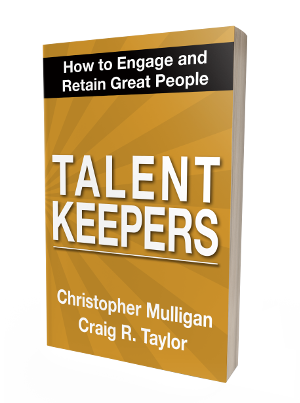 In “Talent Keepers: How to Engage and Retain Great People,” Taylor and Mulligan use their decades of experience to provide strategies that inspire people to make a commitment to their employer, their role and their leader. “Talent Keepers” puts a new spin on a systematic approach to employee engagement and retention by providing precise tactics that have achieved proven results. It includes powerful methods of engaging employees beginning the moment they are hired. Failing to sustain employee engagement leads to poor performance and costly turnover. The loss in productivity coupled with the expense of replacing a decamped prized staff member can translate into anywhere from 30% to 200% of that worker’s annual salary. Christopher Mulligan is a national speaker, CEO of TalentKeepers, and executive coach to senior leadership teams within hundreds of organizations, Christopher’s twenty-eight years of industry experience bring a unique understanding of what it takes to maximize organizational performance through people. Craig R. Taylor is a vice president at TalentKeepers and a former Walt Disney Company executive. He is a leader in the corporate training and organizational development profession and is an award-winning author and national speaker.